It’s tough to think of dogs without thinking of bones. They’re like peanut butter and jelly. Tom and Jerry. Ying and Yang. They may love their kibble, but dogs (or our dog, at least) are never happier than she is when she’s stretched out in the sun gnawing on a bone. So what are the best dog bones? It’s not rocket science, but there are still a few important things to keep in mind before you just start throwing bones at your dog. We’ll go over those things, and we’ll give you five good recommendations for bones you can try (our pup's personal favorites—and believe me, she’s tried a lot). 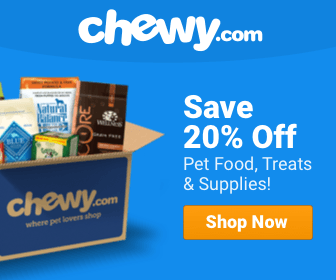 **Below, you'll find our more detailed reviews, but you can also click the links above to see current prices or read customer reviews on Chewy. What Are the Benefits of Chewing Bones? There really are a bunch of benefits of bone chewing for all kinds of dogs. Here are just a couple. Of course, the best way to ensure your dog’s got her dental health under control is to take her for regular cleanings and to brush her little doggy teeth every once in a while. In the meantime, though, it’s really good for her canines to chew, chew and chew some more. And it’s even better if she’s chewing something extra chewy. There are quite a few things than can accomplishing this. For example, you can feed her a dog food that has chewy kibbles. Or you can pick up some dental chews. However, one of the most effect chewables for your pup’s teeth is a good old fashioned bone. Bones and rawhides are great for teeth—mostly because they take so long to chew, but also because they’re a bit tougher than some of the softer chewing options out there, which means your dog will get some great scrubbing in. They’re fun and release stress. We live in an apartment, and when we take Chewy out, she’s always on a leash. She’s got a few regular playmates, and we try to take her to the dog park every once in a while, but she still gets a bit bored. She’s also been known to get stressed every now and again. This was especially true when we were crate-training her. Our solution for both of these things has always been to give her a good bone to chew on. Chewing on bones is fun for dogs. They love it. It’s something to focus on and something to think about it. It’s also a very good way for them to release excess energy, which makes it a good stress reliever as well. In my experience, as long as our dog is getting good exercise and eating well, there are very few problems that can’t be solved with a good, chewy bone. It satisfies the urge to chew. Despite her name, our pooch has never been a destructive chewer. In fact, we didn’t even pick that name. Our friend was fostering her and picked it because it seemed to fit her, and we honestly couldn’t think of anything that fit better. So it stuck! However, not every dog is like ours. Some dogs have a really strong instinct to chew, and if they’re not satisfied, that urge can manifest itself in really ornery behavior. At best, you might find a few of your favorite shoes chewed to shreds. At worst, your pup may swallow something that makes her sick. Of course, lots of exercise and a little discipline go a really long way to curb destructive chewing habits. But one of the best things you can do is give your dog something productive to chew on. The odds are good that she’d rather be chewing on a nice, big, meaty bone than your shoes anyway. Bones do a really good job of satisfying this instinct and keeping your pup from finding other, less productive ways to fill it. Now, just because dogs like bones doesn’t mean you can pick any old bone for any old dog. Choosing the right bone will make the experience a lot more fun for everyone; plus, choosing the wrong bone can even be unsafe. Here are a few basic guidelines. This is probably the most important thing. And it’s especially important for big dogs, since they can sometimes be overzealous, and a small, tough bone can be a choking hazard. Ideally, you want to get something that’s big enough for your dog to feel like it’s got a mouthful but not so big that they can’t get the whole thing in their mouth. Some dogs are also really picky about the size of their bones, so it may take a bit of trial and error. There are a couple different types of bones out there, but the thing you need to remember is that heavy chewers need what’s called pressed rawhide. This is a type of rawhide that’s compressed before it’s dried, making it much tougher than average. Tough rawhides last longer. Another good option for heavy chewers is bones made out of synthetic materials, like Nylabones. If your dog has a softer mouth, go for a softer rawhide (duh), or try smaller rawhide chips/twists instead of full bones. There’s no hard and fast rule here. You know your dog better than I do. But some dogs can be picky, and there’s no shortage of flavors out there. Our dog, for example, usually likes plain old rawhide bones the best. She’s not really into, say, hickory smoked bones. Plenty of dogs love that kind of thing, though! This is a great, long-lasting bone. It’s the favorite of more than one of our big-dog friends. One of the best things about it is that it lasts a really, really long time, so it’s a great option for heavy chewers. 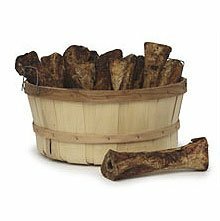 It’s made from real femur bone, so even though there’s no flavoring, it seems to have plenty of natural scent and flavor (at least to a dog’s nose; I couldn’t smell much of anything). One of the things I really like about it, though, is that it’s hollow. So, if you want to keep your pup occupied for even longer, you can stuff food in there. It’s kind of like a natural Kong. Overall, it’s a great, natural, tough bone. This is one of the few synthetic bones we’d really recommend enthusiastically (in fairness, though, we haven’t tested that many extensively). 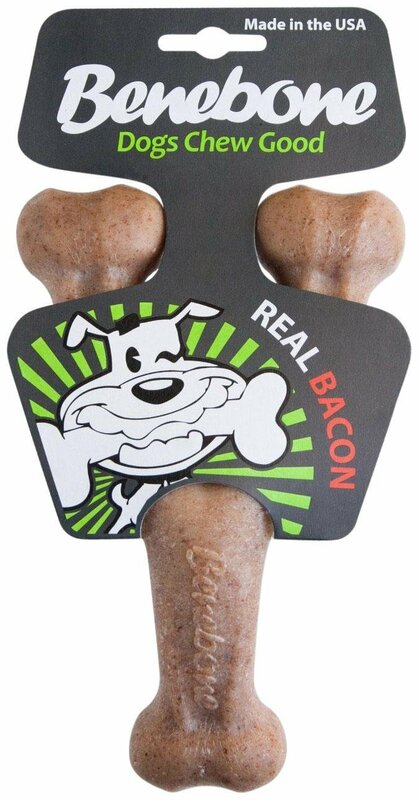 This thing has two ingredients: nylon and real bacon. It’s not meant to be swallowed, but they made it with real bacon. So it should keep your dog engaged and chewing for a really long time. The design is great, too. Its size makes it a good choice for a really wide variety of dogs. However, please note that this bone is not intended for dogs bigger than 70lbs, since they could break and swallow it. This is a good synthetic bone that gets high marks across the board. This thing is a monster. If you have a big dog who destroys every bone set in front of him, try this one. 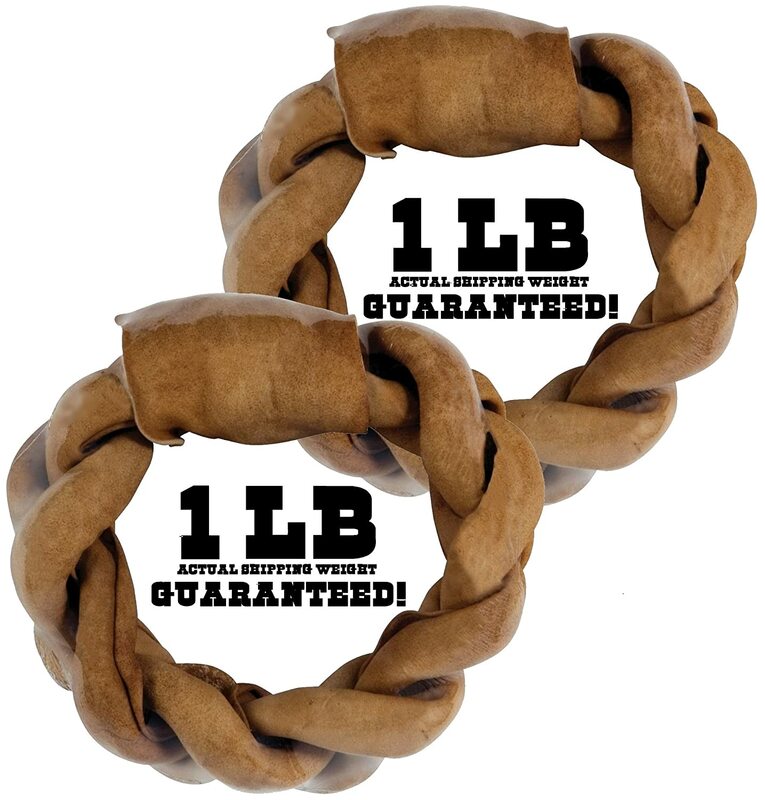 It’s made with ultra-thick, pressed rawhide that takes a real beast of a dog to get through. Another cool think about this one is that it’s made with grass-fed, free-range beef. So it’s a good option if you’re a dog owner who’s concerned with ethically sourced products. Obviously, this was a bit too big and too tough for our pup, so we gave it to our pup's friend, Benny. He’s not a super aggressive chewer, but he was big enough to give it a whirl, and he really liked it. If you want a bone a little closer to what your dog might find in the wild, this is a pretty good bet. This bone is 100% natural and contains no artificial coloring or flavoring (i.e. it’s not bleached white). In my experience, I’ve found that most dogs like this, but some, for whatever reason, don’t. It also means it’s probably going to stink a little, especially if your dog takes a while to get through it. However, it’s great for, say, a hunting dog who spends a lot of time outside. This thing is pretty hefty, so it’s probably not the best choice for a little dog (it was certainly too big for our dog). I wanted to include a braided rawhide option mostly because our dog seems to love them so much. It must be something about the shape or how it feels in her mouth or something. Who knows. But given the option, she’ll almost always go for the braided bones. This bone is also made from grass-fed beef, but it’s not free-range. This particular bone smelled amazing to our pup, but it was a bit too much for me after a while. However, our dog takes forever to get through her bones, and she tends to hide them in the couch, so I probably was a little more up close and personal to this bone than most people would be. Overall, it’s a pretty good one. 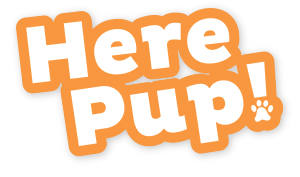 Best Heartworm Medicine For Dogs – Top Picks & Comparisons!